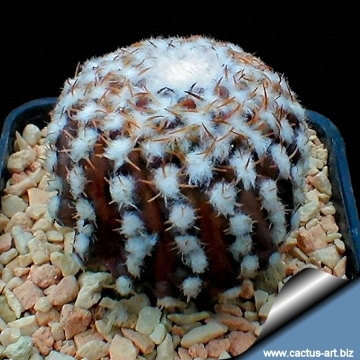 It is a small reddish-brown cactus with bright white woolly areoles and (usually) short spines. 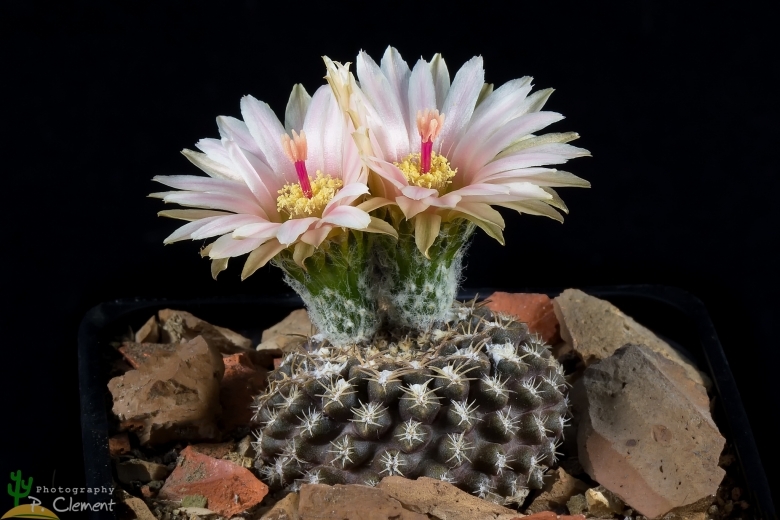 Origin and Habitat: Eriosyce odieri is endemic to a small area ranging from Caleta Cifuncho (25°39’S-70°36’O), Antofagasta region, to the Copiapó Valley (27°15’S-70°55’O), Atacama Region. (extent of occurrence <10,000 km2), its presence in no more than 10 locations. This species is common in the southern, but rare in the northern portion of its range. 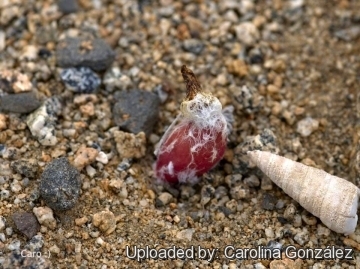 The variety odieri is only found in the habitat of Morro Copiapo (27° 9'S - 70°56'O) an solitary mountain alongside the sea 10 km south of Caldera. The variety monteamargensis is found in the environment of Monte Amargo (27°21'S - 70°43'O) the old train station, 30 km sud-east of Caldera. Altitude range: 0 to 500 metres above sea level. 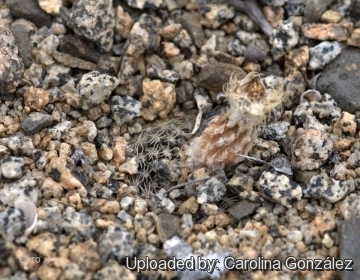 Habitat: This species only occurs in the central northern coastal area of the Atacama desert in big valley and gully, on low costal flats and slopes in stony and very draining soil in areas where very little else grows. It's a very drought tolerant species. Despite the lack of rain where it lives, the extreme aridity is attenuated by the frequent, often dense, coastal fogs. The fog tends to concentrate in the form of a cloud band It shows a recurrent pattern; usually it is overcast in the early mornings, the clouds dissipating during the late morning and returning during the late afternoons. Its seeds are dispersed by wind. 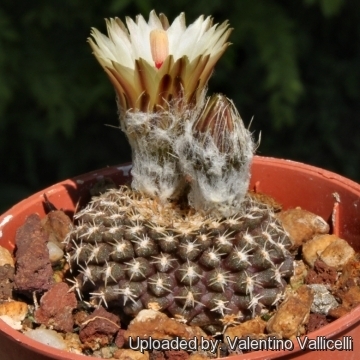 This cactus is threatened by collection for ornamental purposes. 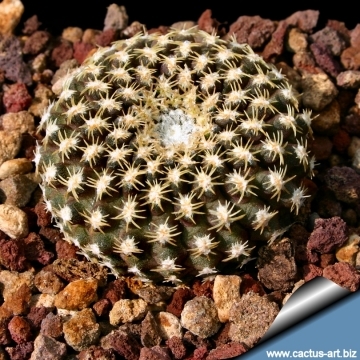 Description: Eriosyce odieri is a greyish-green geophytic cactus that grow flat to the soil or often in time of drought, shrunken back into the ground. Often it acquires a reddish, purplish, brownish or almost blue-black colour due to sun exposure. Two subspecies are recognized, the nominate form and subsp. krausii (F.Ritter) Ferryman. 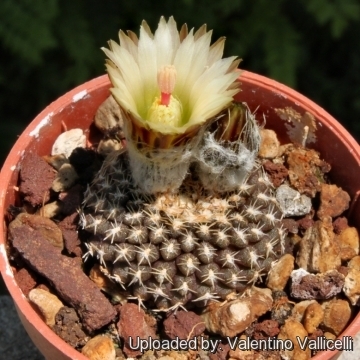 Also included in the synonymy for this species is Thelocephala malleolata (F.Ritter) F.Ritter. Stem: 3-5 cm in diameter, subglobular (flattened in the upper part) often spineless when old. Ribs: 18-21 almost indistinguishable and tuberculate with the podaria arranged in helical lines. Mamilleae 4-6 mm in diameter. Radial spines: 6-12 approx 2-5mm long, spreading, flattened against the tubercles and pectinate, and not intertwining with those of the other areoles, yellowish, white or pale coffee coloured. Central spine: Usually absent or 1 short. 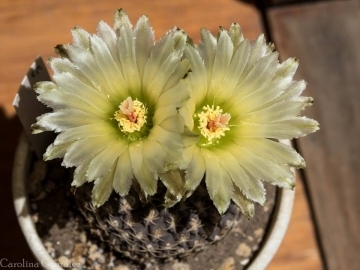 Blooming season: It starts flowering when the stem reach 2 to 6 cm in diameter. Fruits: Covered with rigid bristles in the upper portion. Dispersed by wind. 1) Faundez, L. & Saldivia, P. 2013. Eriosyce odieri. The IUCN Red List of Threatened Species 2013: e.T152695A666993. http://dx.doi.org/10.2305/IUCN.UK.2013-1.RLTS.T152695A666993.en. Downloaded on 18 February 2016. D & N Taylor (Eds). Succulent Plant Research Volume 1. David Hunt Press. Surrey, England.